Naughty Dog plans to expand Uncharted 4 multiplayer with quite a bit of DLC, but you'll never have to pay extra to unlock any of it. The developer laid out its plans for the online component to Nathan Drake's final adventure on the PlayStation Blog, leading off with a promise to never fragment the player community with paid-exclusive map or weapon packs. This will be welcome news for folks who were turned off by the way Naughty Dog handled microtransactions in Uncharted 3 and The Last of Us. Both games had paid map packs, while The Last of Us even kept some of the best guns in the game locked behind further purchases. The Last of Us' multiplayer mode was uniquely tense and clever, so it was always a shame to get wrecked by folks who were willing to spend more money than you. With Uncharted 4, Naughty Dog plans to release new maps and modes to all players on the same day at no additional cost. You'll be able to use Relics that you earn from winning games or completing challenges to buy "DLC chests" full of new loadout items or vanity gear. Or you can buy chests with Uncharted Points, but your new guns and/or hats will still be randomly drawn from the same pool. Naughty Dog plans to roll out new Uncharted 4 multiplayer features through Spring of 2017 (and potentially beyond), including the addition of a co-op mode coming in autumn 2016. 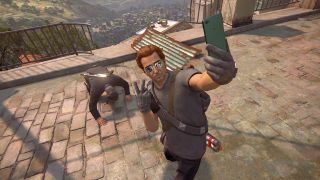 Before you get all excited about playing through the standard campaign as the reunited Drake brothers, it will probably be more standalone co-op missions like in Uncharted 3. Uncharted 4 will be released on May 10, assuming you're not already playing one of those early copies.